Additives and flavours – do they work or are they a waste of time? Anything that gives me more chance of getting a bite has to be worth investigation. Much of my winter fishing revolves around the feeder, and in coloured water I work on the principle that if I can get the fish to find the micro pellets around the feeder then they should take the hookbait next to it. To achieve this, I pack a couple of flavourings in my bag – Ringers Chocolate Orange spray and stick mix liquid. Once my micro pellets are perfectly dampened for wrapping around a Hybrid feeder I’ll douse them in a five second squirt of stick mix liquid. The end result is pellets that smell lovely and which will put out a scent for the fish to locate. My hookbait is straight from the tub – if I can get the fish to find the micros, they’ll soon take the bait! In coloured water it has to be a bayonetted Ringers Allsorts which are fluoro pink, yellow and white. I also have a tub of the old faithful Chocolate Orange wafters on the go too. I throw one of each into the water at my feet, see which one is the most visible, and use that. Using groundbait around a Method or Hybrid feeder has fallen out of fashion but it does give you another way of putting more smell into the water and it can be very good for getting a pull when the fishing is hard. 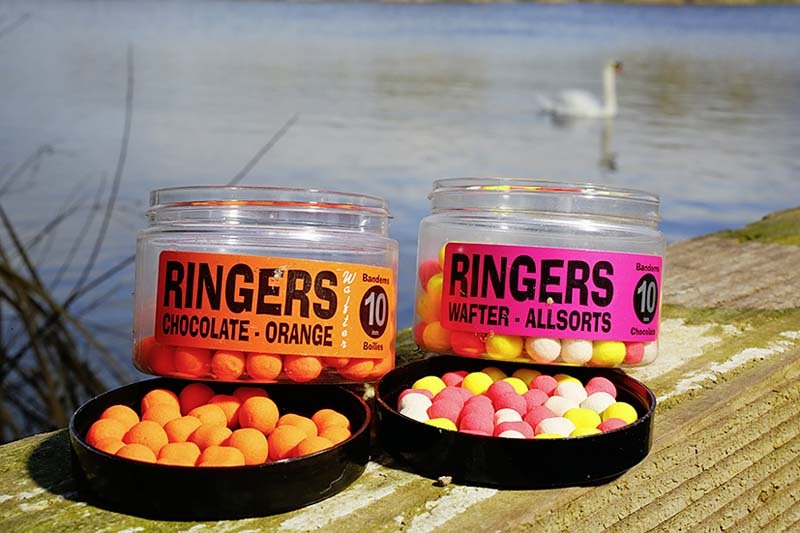 I use a ratio of one third groundbait to two thirds pellets and go for Ringers Original fishmeal mix in dirty water, changing to Ringers Dark if the water is a little clearer.